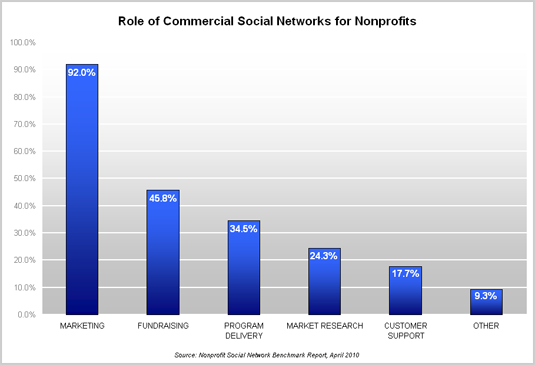 How are Nonprofits using Social Networks? Looking at how survey respondents use commercial social networks, the most popular role is for traditional marketing—to promote the nonprofit’s brand, programs, events or services—with 92.5% of survey respondents indicating this role as the purpose of their presence on commercial social networks. The second most popular role is for fundraising (45.9%). Program delivery (34.5%) and market research (24.3%) via the social network are utilized, but less frequently.